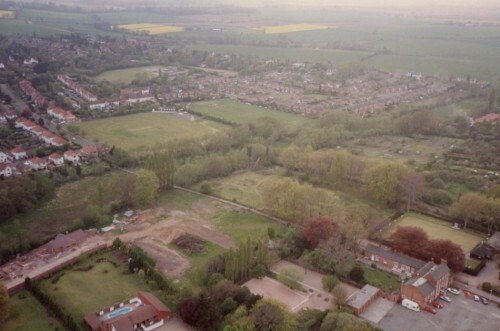 Plenty of change has happened since this photograph was taken in 1991.The Quorndon Fox is shown lower-right with garages that have since been demolished. Above this is Quorn Mills Park Bowling Club green. To the left of the bowling green is an area of land that is shown as The Park on ancient maps of the village. The building site lower-left is now the Sanders Road development. The cut-through path leads from The Quorndon Fox through to Spinney Drive. Note that it was originally straight but has since been "kinked" to allow housing on the site. The cricket ground still exists. The field to the right was Quorn Football Club - the site has since been developed and is now Sutton Close and Holloway House (Abbeyfield).